Rumi is one of the poets I most love referencing in yoga class. So many of his poems speak of the moon, its power, and its other extraordinary qualities. “I am a slave of the Moon. Talk of nothing but moon. Or brightness and sweetness. Other than that, say nothing. Don’t tell of suffering, talk of nothing but blessings. We often come to the mat with an agenda: We are there to “do” something. We have goals in mind, and we aspire to move through a particular flow. We do on the right side of the body what we do on the left, and we then leave inspired and ready to take on the day. Sun salutations are most frequently used as morning practices to align one’s energy with the solar energies of radiance, penetration, and production. This is all well and good, of course, as being productive has much merit. There is also merit in silence, in receptivity. This involves a willingness to settle into the magnetism of a pose—simply resting into what is, as it is. It also involves taking long, slow breaths which are available to us in every single moment. 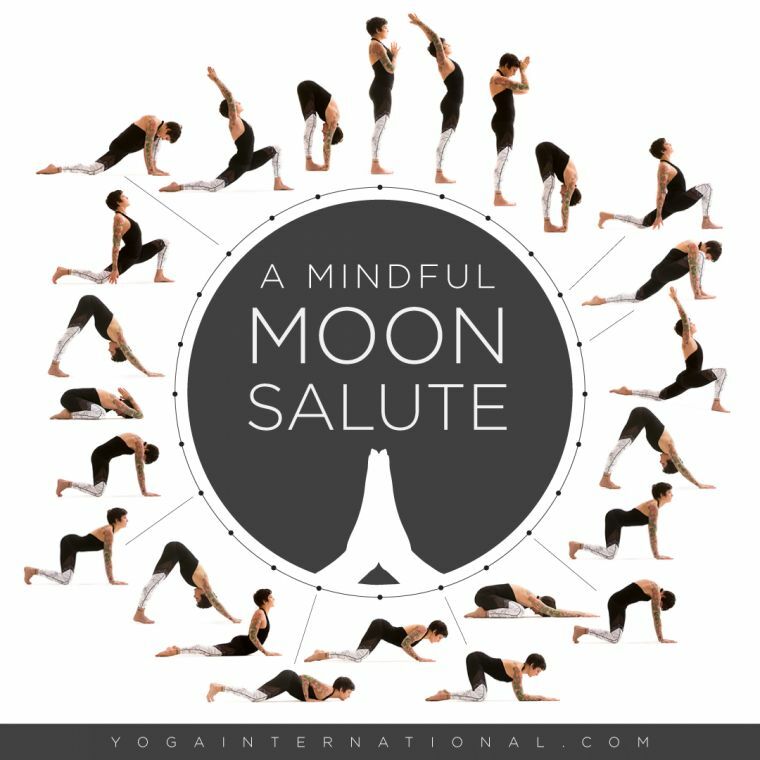 Moon salutations allow us to experience the essence of lunar energy, and to see the moon’s qualities as part of ourselves, as well as integral to the natural world. Whereas the qualities of the sun include paternal masculine energy, penetration, radiance, outward expression, and productivity, moon qualities express maternal feminine energy, magnetism, internal reflection, and pure presence. Moon salutations allow us to experience the essence of lunar energy, and to see the moon’s qualities as part of ourselves, as well as integral to the natural world. The practice I’m about to share with you is perfect for a full moon, for an evening spent on the mat, or whenever you may need to wind down and rest a while. It can be a stand-alone practice, or used as preparation for a self-guided asana practice, a mantra session, a retreat to the kitchen to make ghee (classically prepared on a full moon), or to nestle into yourself on the meditation cushion. The point of this practice is to turn down the busy, and to turn on the moon juice. Focus on exhaling down the body and inhaling up the body. Once you are settled into each pose, remain there for a minimum of three breaths. Use the breath to explore the movement: Rather than holding a pose as static, allow it to host an experience of aliveness. This practice can be used to loosen tension and dislodge unfruitful thoughts, feelings, and physical patterns that decrease our ability to enter and stay in the flow of life. Standing at the top of your mat in pranamasana, bring your hands together, with thumbs touching each other at the heart center. Close your eyes, and visualize the full moon at the center of your brow. Allow the following descriptors, the essence of moon energy, to fill you in the way a mother’s milk fills her hungry baby: creamy, soothing, nourishing, nurturing, satisfying, wet, majestic. Take three full breaths, allowing the exhale to drip down your body like warm cream, and with each inhale filling you from the bottom to the top. On your next inhale, raise your arms above your head, arching back gently as you expand your low belly, your moon center, to the heavens, allowing all that surrounds you to enter you. Take three breaths here. Take a nice deep breath in, and as you exhale slowly lower your hands to your brow, gently bowing your head and offering your consciousness to the innate energies of the full moon. Again, sense the nurturing, soothing, full juiciness that is available to you: no pushing, forcing, penetrating, or forging ahead—just magnetic mama energy here to hold you and to nourish you. Settle in, and take three breaths. Take a deep breath in, and on your next exhale, gently and slowly melt into a forward fold, sliding your hands under your feet (if you choose) as if your upper body is made of warm oil pouring down and over your belly, buttocks, legs, and feet. Stay for three breaths. Inhale as you release your hands from beneath the feet and step your left foot back into a lunge (placing your hands above your right knee, or allowing your fingertips to touch the floor on either side of your hips). Sense how the energy rises up from the earth—through your low belly to your heart, your throat, and then up to the crown of your head as you gently lift your heart. Remain here for three breaths. As you exhale, allow your upper body to pour forward, hands touching the earth on either side of your right foot, head bowing down toward your inner right knee. Sense your eyes and jaw relaxing, allowing the lips to part so much that you feel as if you could drool (just like a relaxed baby in her mama’s arms). Soften here for three breaths. On your next inhale, with arms reaching upward, palms together, arch back gently, emulating the shape of a sliver moon. Breathe here for three full breaths. Place your hands on the earth and step your right foot back to form an inverted V. This mountain pose looks much like downward dog, but with your feet a little closer to the hands for more stability—embodying the solidity, groundedness, and patience of a mountain. Take three breaths. Inhale to prepare, and exhale as you lower your knees to the floor. Inhale into cow pose. Exhale as you round your back into cat pose, allowing your head to release downward—now seeing the full moon behind closed eyes, and settling into the strength of the pose. Allow three rounds here, inhaling into cow pose and exhaling into cat, finally finishing in cow on an inhale. 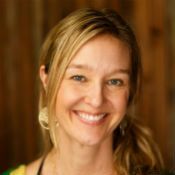 Settle back into child’s pose, bringing your brow to the earth as you recall the essence of the moon, reflecting on its qualities and the importance of each quality, as well as where you might identify each of the following qualities in your body: juicy, soothing, nourishing, nurturing, magnetic, whole. Stay for three breaths. Inhale as you begin to slowly transition from resting child’s pose to the top of your mat, staying as close to the earth as possible as you expand your front body as if you were cream being poured over the floor. As you find your way into eight-pointed salutation, the undersides of your toes and the pads of your feet will ground you. Your feet, knees, the fullness of your palms, the center of your chest, and your chin all connect on the earth. Take three full breaths here. On your next inhale, release your belly to the earth and slowly slide forward into cobra, remaining aware of the tops of your feet connecting to the earth; allow the inhale to lift you upward into the fullness of this juicy backbend as you envision the hood of the cobra expanding up and around you. Stay here for three breaths. Take a deep breath in, and draw the low belly in as you exhale, tucking your toes, lifting your sitting bones to the sky as you return to mountain pose. Take three complete breaths here as you nourish your body with the subtle movement of the breath throughout this pose. Inhale as you release your knees to the floor and come into cow, then complete three full rounds of cat-cow, seeing the full moon behind closed eyes, and finishing on an inhale in cow. As you exhale, release back into child’s pose, allowing your forehead to rest on the earth, while bending your elbows to bring your palms together at the nape of your neck. Offer this mudra as gratitude to the force that illuminates the moon and nourishes all living beings. Rest here for three breaths. Release your hands to the floor and return to hands and knees. Take a deep breath in, and draw the low belly in as you exhale, lifting your sitting bones to the sky, returning to mountain pose. Take three complete breaths here. On an inhale, slowly step your left foot forward between your hands, allowing your hands to either remain on the earth or rest above your left knee, rising up and opening the spine into a slight backbend. Sense the fullness that is here. Stay for three breaths. As you exhale, allow your upper body to pour forward, hands touching the earth on either side of the feet, and head bowing toward your left foot. Allow your eyes and jaw to relax, and for the lips to part so much so that you feel as if you might drool. Having been here before on the previous side, reflect on the expanding fullness in your body as you settle into that fullness for three breaths. On your next inhale, come into crescent pose: with your arms reaching upward, palms together, gently arching your back to emulate the shape of a sliver moon. Breathe here for three breaths, acknowledging the power of the moon to always—and in all ways—magnetize and nourish. Take a deep breath in, and as you exhale, slowly bring your right foot up to join your left, and then fold forward, sliding your hands under your feet if you wish, releasing anything you have dislodged through this salutation. Stay here for three breaths. On your next inhale (releasing your hands from underneath your feet), rise seamlessly, either rolling up or simply unfolding upward, avoiding any large movements, finally coming back to standing prayer pose. Allow the quiet, steadiness, and stillness to infuse your whole being. Take three breaths here. On your next inhale, raise your arms above your head, arching back gently, as you expand your low belly, your moon center, to the heavens, allowing all that surrounds you to enter you. Open your mind and body to everything around you, awakening yourself completely to the gracefulness and wisdom of the moon. Take three breaths here. Take a deep breath in, and as you exhale bring your palms together at your brow—as a final offering to the moon both in the sky and within you. Gently bow your head and pour your consciousness into the magnetic, maternal energy that is here to hold you and to nourish you. Allow your breath to slowly transition you to whatever it is you are called to do next. You may find it feels natural to take a seat at the top of your mat, placing the palms of your hands on your second chakra, about two finger-widths below your navel, and chant three times, Om Chandraya Namah, “I offer my salutations to the moon and its powerful qualities. May these qualities be awakened within all that is birthed, sustained, and transformed in my life,” as closure for this salutation, and as a potent opening into whatever comes next. Upon completing this salutation, you may find yourself called to an intuitive asana practice in which whatever you do, and whether you balance right with left, is of little importance. It is also a perfect time to settle into meditation, to rest in silence for a few hours, or to take your yoga off the mat and into the kitchen to eat or prepare something nourishing.